Manx2 chairman Noel Hayes pictured at the launch of the Belfast-Cork route in September. THE AIRLINE operating the flight involved in this morning’s fatal crash at Cork Airport had only begun flying on the Belfast-to-Cork route in September, and had only established a permanent base in Cork last October. The Belfast-to-Cork route – on which flight MN 7100 was operating when it crashed on landing on Cork’s Runway 17, its main landing strip – had only been established in August, with flights beginning on September 8 last. The route had been taken by Manx2 only after Aer Arann decided to withdraw its own services along that route, having gone into examinership last summer. Aer Arann had operated a twice-daily flight schedule from George Best Airport, and it is believed that Manx2 had taken over the route to operate the flights on exactly the same schedule. Alongside the 7:50am service scheduled to land at 9am, an afternoon flight was due to depart Belfast at 4:10pm, with scheduled arrival at 5:20pm. Those flights are partnered by return routes departing Cork at 9:20am and 5:40pm, with both flights scheduled to last 70 minutes. The route had proved successful for the airline, which later in September decided to establish a permanent base at Belfast City, which involved transferring some of its previous services that had operated from Belfast International. He told the BBC two weeks ago: “It’s my worst year ever in the aviation industry”, saying that the airline had seen its passenger numbers fall by 11 per cent overall in 2010. Manx2 is referred to as a ‘virtual airline’, which outsources the ownership and operation of its flights. The Metroliner SW4 aircraft which crashed in Cork this morning had been leased from Barcelona-based ground handler Flightline BCN. A spokesman for the Spanish company declined to comment on the nature of the airline’s relationship with Manx2 when contacted by TheJournal.ie. 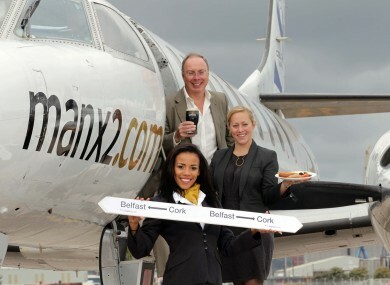 Email “Manx2 accident within six months of Belfast-Cork launch”. Feedback on “Manx2 accident within six months of Belfast-Cork launch”.